As we wrapped up 2018 in December, the housing market held steady, with just a bit of slow down for the holiday season. There was a slight drop in sale prices, but the change was a small one and not expected to continue into 2019. Looking at the overall sales for 2018 Key West homes are in demand and selling quickly. Comparing data from a year ago, list prices were up, with the average list price for December 2018 at $959,535 compared to $926,062 a year ago. This is a 3.61 percent increase in year-to-year data. Median list prices for the month went up as well, coming in at $679,999, up by 4.78 percent from $649,000 in December 2017. Year-to-date listing prices continue to show a rise as well, with a median of $695,000, a 7.09 percent increase, holding steady from the month before. Both average and median sale prices for the month went down by a small percentage each. Average sale prices for December 2018 came in at $694,258, compared to $727,739 in December 2017. This is down by 4.60 percent. Median sale prices saw a small drop, reported at $557,500, compared to $577,500 a year ago, down by 3.46 percent. December’s sales report shows 32 properties sold in Key West, compared to 48 homes sold in December 2017, a 33.3 percent decrease. Year-to-date sold listings ended up on the positive for the final month of the year, with 587 listings sold, compared to 564 last year for the same period, a 4.1 percent increase. There were 96 listings added to the market last month, with a total of 549 active listings for the market. Of the active listings on the market, 142 are priced at $99,999 or below, with the majority of the other properties from $350,000 and up. 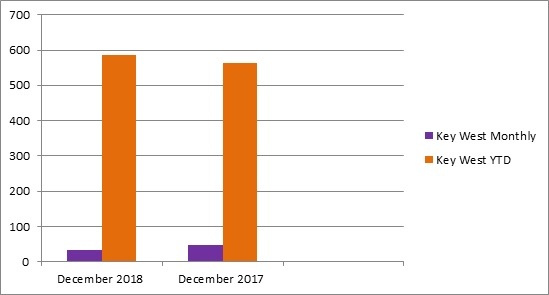 Days on the market for December 2018 compared to the year prior reflects one of the last vestiges of the impacts from Hurricane Irma. 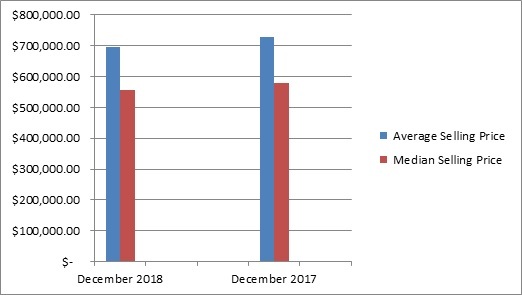 The average days on the market for listings sold last month was 95, compared to 215 days a year ago, while median days on the market went down to 77 days, compared to 105 in December 2017. Year-to-Date days on the market reflect the steady demand for homes, with a closer range on the average days; 158 days on average compared to 156 days last year. The median days on the market for the year show a decrease of 14.46 percent, down to 71 days from 83.